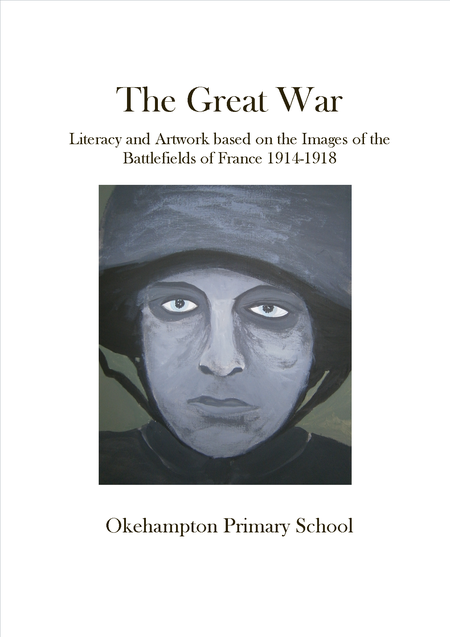 We are currently exhibiting the children's work from our original exhibition of The Great War in 2014 from our book 'The Great War', Literacy and Artwork based on the Images of the Battlefields of France 1914 - 1918. This work was completed by the children in Year 5 and 6 and was completed within a series of workshops. Once completed, the artwork and literacy was put into a book which we are very proud to exhibit once again. Please feel free to download this book in the attachment. In addition, the children in Year 4 took part in a series of lessons looking at the historical images and references to life in Okehampton during the times of The Great War. They produced literacy and artwork based on the changes that 100 years past have presented. They also took part in a photograph of Okehampton Children 100 years ago at Okehampton Castle, finding exactly the same spot and poses as those in 1918. With the World War I centenary upon us, our Year 5 children experimented with charcoals to create an atmospheric sketch of life on the frontline. We hope that you enjoy the work that surrounds you in The John Young Gallery at The Museum of Dartmoor Life, Okehampton. We have set up a 'Field of Remembrance board in which you can say thank you to this generation of inspirational and brave young men and women. The exhibition is open to the public from Tuesday 30th October until Sunday 2nd December 2018.